Wrightsville Beach, N.C. … The Oprah Winfrey Network (OWN) will feature surf camp action from Wrightsville Beach on Saturday, August 6, 4-4:30 p.m. The half hour segment is part of a five hour Oprah marathon titled: “The Swell Life” with Izzy Paskowitz, head of the family’s surf camp Surfers Healing for kids with autism. Wrightsville Beach, N.C. … The Oprah Winfrey Network (OWN) will feature surf camp action from Wrightsville Beach on Saturday, August 6, 4-4:30 p.m. The half hour segment is part of a five hour Oprah marathon titled: “The Swell Life” with Izzy Paskowitz, head of the family’s surf camp Surfers Healing for kids with autism. The entire series can be seen Saturday, 12 noon – 5 p.m.
On August 22, Izzy and friends will be “in person” on Wrightsville Beach with the annual Surfers Healing stop, one of only 16 coast to coast, to teach and surf with children who have autism. Founded in California by professional surfer Israel “Izzy” Paskowitz for his son, Isaiah, who was diagnosed with autism at age three, Izzy discovered the positive impact that surfing had on his son, and now shares this unique therapy with other children diagnosed with autism. Those families who missed the Surfers Healing registration deadline are invited to Wrightsville Beach for Ocean Cure’s camp for children diagnosed with autism Aug. 23-26, or the Autism Surf Camp by Indo Jax Surf School August 29-September 2. 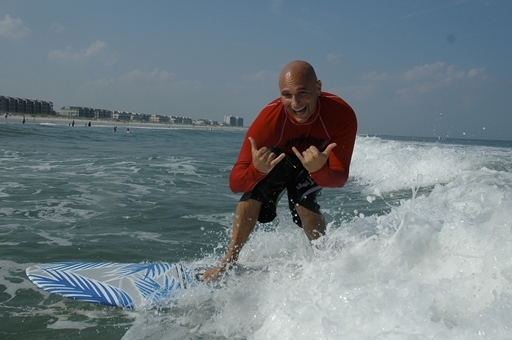 On Saturday, August 13th, 2011 WB Surf Camp will be hosting the Alopecia and Cancer Survivor’s Surf Camp, a complimentary event for up to 100 participants from 7:15 a.m. – 1:00 p.m. The morning will begin with fellowship, plenty of sunscreen, and a ground surf school. Participants will then hit the beautiful warm ocean with professional, certified instructors. Surf sessions will be followed with more fellowship, refreshments and a fun day at the beach. Alopecia Areata and Cancer have “hair loss” in common. Many people undergoing cancer treatment will lose their hair, so not only do they have to fight for their lives but they also have to deal with the psychological trauma of losing their hair. WB Surf Camp’s founder, Rick Civelli, was diagnosed with Alopecia Areata when he was 17 and has shaved his head most every day since. “I lost the majority of my head hair in less than a week, so I just shaved my head because as a surfer, I had to get into the ocean to surf. I want to share my passion of surfing and the amazing confidence building and healing powers of the ocean with others affected by Alopecia and bring a smile to their face. If I was not a surfer, I’m not sure how I would have dealt with it”, says Rick.